This book covers the entire spectrum of activities in a typical merger transaction—starting from searching for candidates to closing the deal. 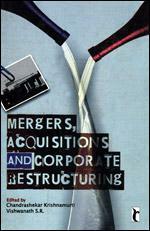 It is designed to be a rigorous yet relevant book on mergers, acquisitions and corporate restructuring for students, research scholars and practitioners of finance. – Rationale for diversification via acquisition, searching for acquisitions, valuation of publicly and privately held companies, design of consideration in acquisitions, cross-border acquisitions and empirical evidence on mergers. – Various forms of corporate restructuring like spin-offs, carve outs, targeted stocks, reorganization of debt contracts, lay offs and downsizing are covered. – There is also a summary of the research conducted in this subject over the last 20 years.